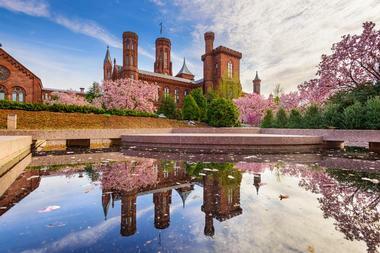 The Smithsonian Gardens in Washington, D.C. is an outdoor extension of the Smithsonian Museum that is responsible for all horticultural exhibits and research and landscapes over 180 acres of the Washington Mall. 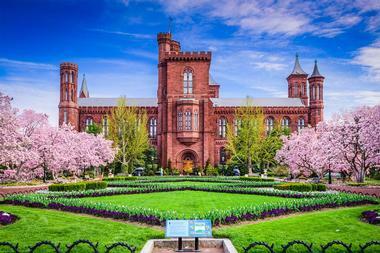 Established in 1972 by S. Dillon Ripley, eighth secretary of the Smithsonian, with the mission of expanding the experience of the Smithsonian through horticulture collections and education. The Smithsonian Gardens Greenhouse nursery operations are a critical part of maintaining the exhibits and gardens around the museums. The greenhouse is home to the orchid collection and nectar plants that are used in the butterfly gardens. All of the plants used in the interior of various Smithsonian museums are also grown here. The gardens and green house are a leader in integrated pest control in The United States and their program is ever evolving based on scientific evidence. There is a special branch of the Smithsonian Gardens dedicated specifically to creating educational programs, documenting all of the collections, and managing the artifact collections which include antique and modern garden furniture, ornaments, and items related to the floral trade. Interns are also overseen by this branch of the gardens. The Smithsonian Gardens are meant to be outdoor museums designed to accompany the indoor exhibits of the same historical context. Each garden echoes the museum that it is grows next to in an effort to enhance the overall learning experience for visitors. Butterfly Habitat Garden emphasizes the relationship between butterflies and the environment. The differences between plants that host the larva and plants that support the butterflies through nectar are explained with cards next to each plant that also describe the life cycle of the plant and butterflies. Visitors can also learn about the different types of plants that they can grow to attract butterflies to their own gardens at home. This garden is over 11,000 square feet and features plants and butterflies that are native to the east coast of The United States. Patrons can tour this garden while visiting the National Museum of Natural History. Visitors should be sure to stop by the Urban garden center where they can learn how to landscape their own butterfly garden in a much smaller space. 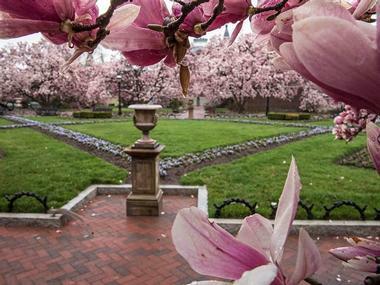 Enid A. Haupt Garden is part of the castle quadrangle that was recently redesigned. The cultural influences from the adjacent museums are reflected in this garden with many stone fountains, benches, brick paths, and many brightly colored floral designs and hanging baskets. The most unique feature of this garden is that it is actually on the rooftops of National Museum of African Art, S. Dillon Ripley Center and Arthur M. Sackler Gallery. Freer Gallery of Art is an Italian Renaissance style courtyard meant for quiet introspection that is part of the museum of the same architectural design, both by Charles A. Platt. The entryways from the museum to the courtyard have been closed off to prevent humidity and other climate related issues from hampering the Asian and American art inside the museum, however visitors can still access the garden with flowing fountains, lush landscaping and romantic arches from the outside. The trees in this garden are reminiscent of calligraphy in the wintertime when their shadows are cast upon the ground, and provide shade and relaxation in the summer months. Heirloom Garden is particularly interesting because it features plants that were popularly cultivated in home gardens prior to the 1950’s. This garden located on the terrace of National Museum of American History hopes to inspire people to start growing the annuals, perennials, and bulb plants once again. This garden changes season to season and is particularly colorful. Hirshhorn Sculpture Garden is a sunken garden in a major urban center of the National Mall. Across from the Hirshhorn Museum, the 1.3 -acre garden features a reflecting pool, terraces, and greenery. The landscaping is not modeling around art works since the 60 different sculptures rotate. Instead, the grounds are neutrally enhanced with willow and pine trees, vinery, and shrubs. Kathrine Dulin Folger Rose Gardenis the center focal point of the entrance to the Arts and Industry Museum. 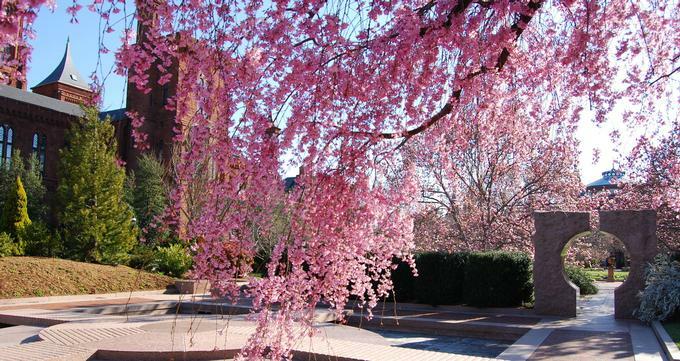 Located just East of the Smithsonian Castle, this garden is beautiful year-round with different species of roses that bloom in summer, spring, and fall. Conifers and Evergreens decorate the garden in the winter time and several cast iron antiques, such as the three tier fountain, are located here as part of the Smithsonian Gardens Artifact Collection. Mary Livingston Ripley Garden has a large variety of plants and flowers that creates an oasis through raised garden beds and beautiful hanging baskets that are cultivated in the Smithsonian Greenhouse. Mrs. Ripley, wife of Smithsonian Garden founder, S. Dillon Ripley, established this garden in the hopes of creating an extremely fragrant garden that provides respite for visitors. Iron lamp posts and benches as well as the beautiful fountain create a stunning visual amongs the flowers for guests. Gardens at National Air and Space Museum expand over seven acres of tiered, walled terraces. Many different varieties of trees, shrubs, annuals and perrienials decorate the landscape of the museum. The garden is currently in the planning stages of developing a “flight garden” with the goals of attracting many of the different flying birds and insects in the area. Native Landscape Garden showcases the landscape of the are pre-colonial times when Native Americans were the only occupants of the land. It is quite fitting that this garden is an extension of the National Museum of the American Indian. Over 33,000 plants native to the Piedmont region encompass four distinct habitats—hardwood forest, meadow, wetland, and crop land. This landscape is meant to look natural and undisturbed with wildflowers, water lilies and cattails that are free to grow. The cropland section of the garden features crops planted and harvested in the traditional ways that the American Indians used. 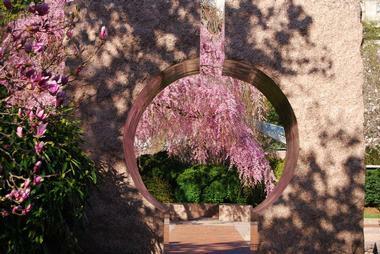 The garden is completely organic and boulders, as well as clay sculptures decorate the space. There is a fire pit and amphitheater located in the area as well where visitors can enjoy performances. Urban Bird Habitat is home to 300 different species of birds that are both native and migratory. The Lost Bird Project, a five-piece sculptural work dedicated to extinct birds, is showcased in this garden. When trees die in this habitat, they are transformed into architectural designs to create housing for birds and other small animals in the garden. Victory Garden, located at the National Museum of American History, is a recreation of the victory gardens during World War II. These gardens were used to ensure adequate sources of food for soldiers and civilians during war times. Governments and communities came together to grow community and personal gardens. Throughout the spring and summer the goal was to produce enough fruits and vegetables to feed your family and neighbors through the warmer months and can the rest to sustain families through the winters. One of the goals of Smithsonian Gardens is to preserve and collect horticultural specimens and artifacts relevant to the floral trade and gardening for research and exhibitions. Through their vast collections, the Smithsonian Gardens has become an outdoor classroom dedicated to teaching visitors about the importance of the relationships between plants and animals. They also put much emphasis on recycling, upcycling and conservation. Archive of American gardens is a digital archive that is created and modified by public participants that upload photographs and videos as well as personal stories of their own gardens at home. There are currently over 100,000 photos and videos of personal and professional gardens in the United States. Orchid Collection is an ever growing collection of orchids from around the globe. New additions to the collections are chosen very carefully based upon rarity, quality, beauty and how well they fit into the current selection. 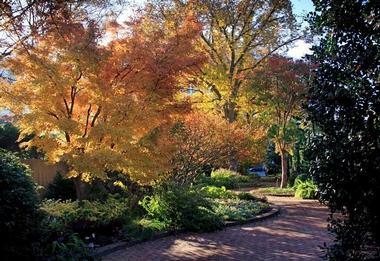 Tree Collection at Smithsonian Gardens is the most recent collection to be started. Currently, the collection has nearly 1,900 different specimens on the museum grounds and Mall gardens. Every piece in the collection is living and cared for by the Smithsonian Gardens Arborist with help from interns and volunteers. Both native and exotic species can be viewed in this collection including Chinese Elms, Asian cherry species and Cryptomeria swhich are all exotic. Some of the native species are dogwood, crabapple and magnolia trees. The gardens are open seven days a week all year-round. Only the Enid A. Haupt garden is gated and open from dawn until dusk. Every other garden is accessible at any time. Gardens tours can be schedule and a leisurely walk through inclusive of all the gardens will take approximately three hours. All visitors are advised to wear good walking shoes and sun protecting since the gardens are outdoor museums. The gardens can also be viewed and learned about online.